How can you and your health care provider create a working relationship based on good communication? A Johns Hopkins primary care doctor and communication researcher tells how. 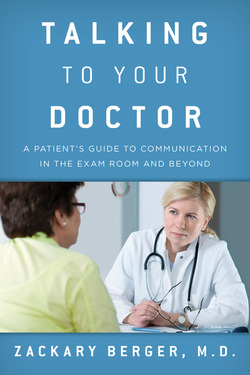 TALKING TO YOUR DOCTOR presents the new science of communication to help improve not just your time in the doctor's office and your own health, but also to promote the health of your community, guiding us toward a humane medicine based on relationships. The author, Zackary Berger, M.D., Ph.D., is a practicing primary care/internal medicine doctor and an Assistant Professor at the Johns Hopkins School of Medicine, where he teaches medical students and residents. He researches doctor-patient communication in the clinic and in the hospital to understand how our health care system can be made more responsive to ordinary people. This book is based on his expertise and the experience of his patients. The last time you went to your doctor, you might have emerged feeling dissatisfied and disoriented. What did you talk about together, after all? You didn’t ask all the questions you wanted answers to, and you don’t remember everything the doctor told you. What is the plan? How do we get there? Nothing was clear after you left the office, and you don’t know whether it’s your fault or the doctor’s. Maybe it’s your fault, or the doctor’s fault, or the blame can be laid at the feet of the entire health care system. But that’s beside the point: the important thing is to identify the problem at the root of this experience and take steps to change it. That’s what this book does.